Riding a bike in a Hamilton winter doesn't require extra equipment or special clothing. An old-fashioned general-purpose bicycle lets me bike all winter long without doing anything special at all. On a sunny afternoon during last week's False Spring, I took my filthy, salt-streaked bicycle to the car wash. And as I rode home past the melting snow banks on my shining bike I smiled to realize that I'd finally managed to bike through a winter. I started trying to bike year-round about five years ago. But I never made it even as far as February before this year. It was never the snow that made me give up; it was always a rusted-stiff chain or frozen-stiff wrists and ears. The Intertubes abound with tips and tricks for the winter cyclist: special lubricants to protect your chain, studded tires, gauntlets and velcro cuffs to keep the wind off your wrists, neoprene balaclavas, goggles, lean-tos and nylon sheds to keep the snow off, winter cleaning regimens involving winter-grade hoses and no-freeze outdoor taps. These solutions involve more time, money, effort and special clothing than I am willing to devote to biking. Biking for me is not a hobby - it's simply my preferred way to get around town. This year I was able to bike right through the winter not because of anything special I bought, made or wore - and certainly not because it wasn't cold and snowy - but because of something decidedly not special. Last spring, I stopped riding a sports bike. Like most people roughly my age, I had ridden racing bikes and mountain bikes from childhood. For the first time, I bought a general-purpose, no-nonsense bike: a 50-lb. Dutch three speed with sit-up handle-bars, full fenders and a completely enclosed chain. I bought this bike for its carrying capacity and its ease of use; winter riding was not on my mind. In fact, I had vague plans of using my old hybrid mountain bike as a beater in order to spare my shiny new machine the muck of foul weather. But it ends up that a few simple features of this shiny new bike make it perfect for winter cycling. The most obvious advantage over my other bikes is that the chain is completely enclosed: I splash carelessly through slush and leave the bike uncovered on my driveway in any weather this side of a blizzard. All without worry of my chain rusting up - something that has happened in a single snowy week to my hybrid. Similarly, I don’t worry about the cables or frame rusting. The cables are completely covered in plastic insulation and the frame is powdercoated multiple times. Simple and effective. 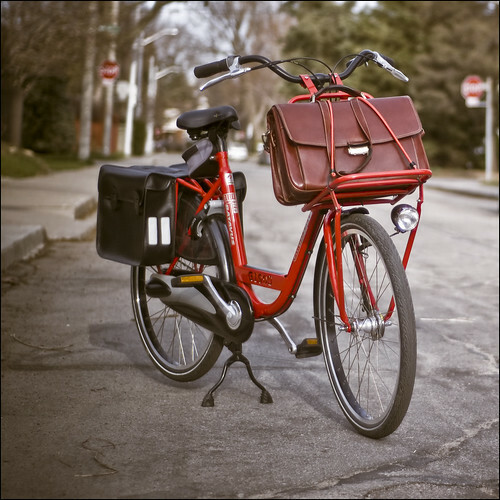 The upright posture of an old-fashioned city bike offered a pleasant surprise as the weather grew colder: without my arms stretched out to reach a sport-oriented handlebar, my sleeves don't ride up - so no wind on my wrists. Since I'm not bent over, I don't have to bend my neck to look up, which means that I can bike in the same furry-ear-flaps hat which I wear when walking - on my hybrid or road bike, the hat would be levered off my head by the back of my collar. Sitting erect also means that I can bike in any of my normal winter coats: I can wear a long overcoat over a sport jacket without worrying that I'm straining the seams; and if I wear a shorter winter jacket, it will still cover the small of my back and my backside completely. So that was the secret: no secret at all; nothing fancy; nothing special. Just a general purpose bike built more-or-less the way they were 80 years ago. Winter biking? Only if you're a pinko commie! I'm a little more of the sport bike bent. But I can't blame anyone who wouldn't want to mess with external gears, cables or brakes at this time of year. Just want to suggest that Smith's or the Bay Gardens offer the best services. Trying to be helpful is all. Great essay Kenneth! One thing I'd love to know is, where do you get a bike like that in Hamilton? As TnT says, Downtown Bike Hounds is about the only option in Hamilton. Some other localish bike shops sell "European-style" bikes that look the part and can be a nice ride, but they miss some important basics that make a bike like this really low maintenance and thus a pretty effortless experience: powder-coated frames, enclosed chains, strong racks. Bike Hounds carries Batavus (Dutch) and Pashely (English). Some other shops closer to Toronto also carry Gazelle, another Dutch brand - a little more elegant than Batavus, perhaps. I'm aware that a three-speed or no-speed bike sounds limiting to and does indeed have its limitations for long-distance or hilly cycling, but I've been really surprised at how rarely I've wanted to pull my hybrid or road bike. Basically never, unless I'm biking down to the far end of Burlington or up the mountain. Biking to the far end of Burlington? That is putting in the miles! Well, to be honest, Westdale to Appleby Line is pretty much the limit of what I'll bike for transportation purposes. That's about an hour and a quarter for me. Roughly speaking, trips on the Dutch city bike take me about 20% longer than they do on the hybrid, so forty-minute trips are when I start thinking about getting on a faster bike. But for downtown or Dundas, each about fifteen minutes away, that 20% is a negligible few minutes. And very few of the errands that I need to run are further than Dundas or downtown. I live near you I think, I'm in Ainslie Wood and I think you're in Westdale. And while I find myself going to Dundas more (during the good weather - my own hybrid stays in the garage for 90%+ of the actual winter) I just cannot hack going downtown. Dundurn or Locke Street is one thing, or even south of downtown, or anywhere near the waterfront. Those are great, and the trail network is where I most prefer to ride. But once I have to get off the trails and quieter streets, and start navigating the madhouse raceway of downtown... I just can't do it. The anxiety and annoyance just isn't worth it for me. Come the spring, my goal is to explore the city using bike and HSR. I imagine DownTownBikeHounds would be the best place to get the info on where to find out. Nice one, Kenneth. I admire your pluck. I'd wager you're "happier" than most. Has anyone heard where this velodrome is going? or should I call my ward councilor?...oh nevermind! The far side of Burlington, or the mountain during busy hours is when I start thinking about putting the track bike away and pulling out something with gears. With a proper roadie, though, even Toronto or Kitchener aren't that far in decent weather. I thought I was alone in thinking that biking to Toronto was feasible. I always wanted to try it, especially when GO installed bike racks on buses. It's nice to have the option of giving up if I get too tired. I guess the feasibility depends on what you plan to do when you get there. So, according to Google Maps, biking from King & Sterling to King and Younge would take between 4 and 4.5 hours, depending on the route. If I were going for the weekend, I'd consider the ride. Even in this weather it would be fine so long as the roads have had time to clear - it would just be a matter of wearing layers given how warm one would get, as Undustrial recommends on the site he references above. But I put the same cap on a bike trip as a car trip when it comes to everyday errands: 45 minutes one way. Any longer than that and I have to seriously rethink where I'm going or how I'm getting there. There's a guy who works at City Hall that commutes from the near side of Toronto. He has a recumbent with a fibreglass ferring, though. Claims it takes him about two and a half hours. My record to Toronto's city limits is just under three hours at a pleasant pace. But if you're doing the round trip, the last leg gets a little gruelling. Wow, look at all the bike paths in KW! There's so many. Is that what those bright green lines are? It's not really clear what sort of bike routes they are, though. Yeah, who knows how well maintained they are. All I know is bike lanes are bright-green, no-car paths. Yeah, an enclosed chain would be wonderful. My last winter beater had the cassette completely gummed up with muck by the end of the season. Either way, I think that an old-fashioned upright general-purpose bike is a good idea, but to me the simpler, more immediate need is to stop selling teenagers bikes with shocks that will never see the kind of terrain that demands that crap. Get a mountain bike with no shocks and pop some street tires on it and you've got something that you can abuse but isn't a complete waste of pedal-energy.